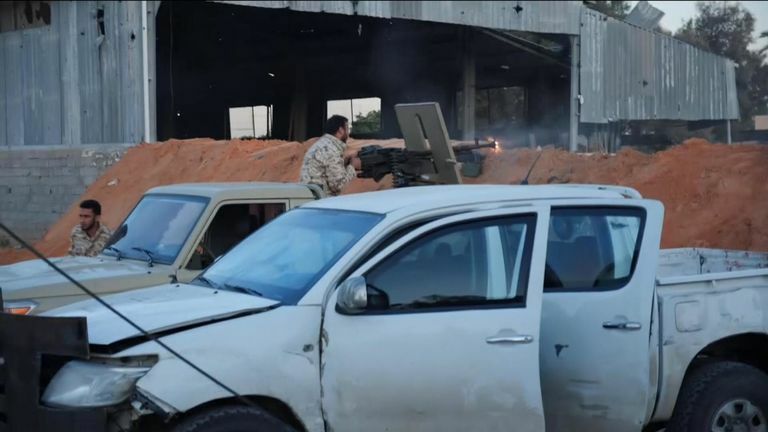 Fierce fighting has broken out in Libya’s capital as military groups try to defend the city against a warlord formerly allied to ex-dictator Colonel Gaddafi. 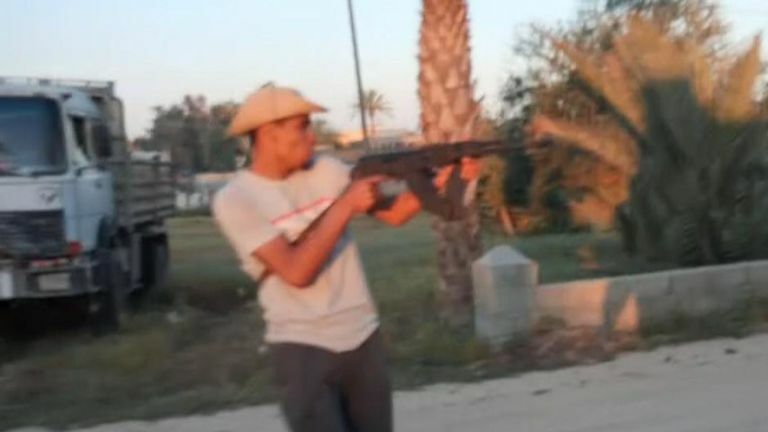 Here, Sky’s special correspondent Alex Crawford gives her first-hand account as she joined forces frantically trying to stop Khalifa Haftar and the Libyan National Army. 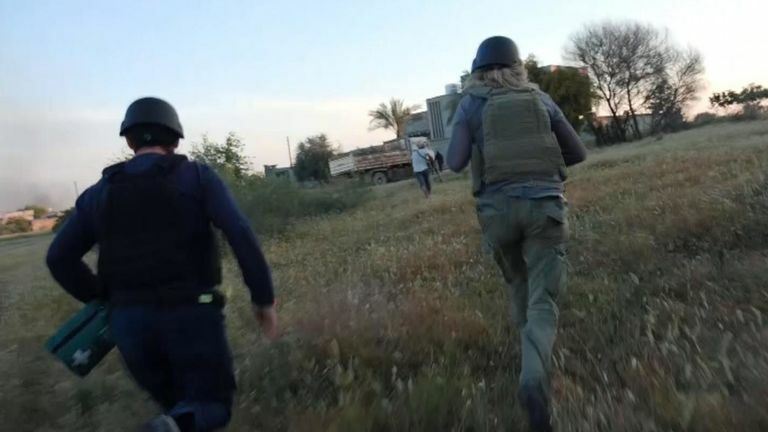 A ragtag group of fighters allied to a range of different militias have banded together to defend the capital – and it’s a jumble of shooting, firing, running and attacking, only to be followed by frantic retreating. Banks of sand are pitched around the capital’s perimeter to stop the advancing fighters commanded by a man who was once a senior commander under the country’s former dictator Colonel Gaddafi. 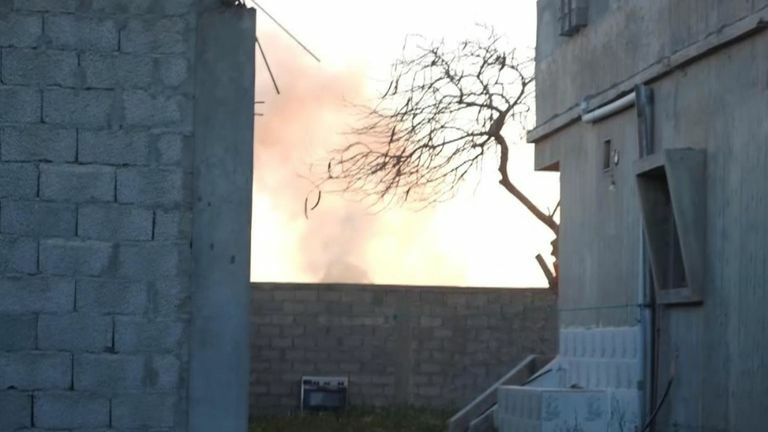 The men fighting with Khalifa Haftar, a warlord who’s set up a rival administration in the east, are pounding about four different battlefronts. His advance on the capital has done what dozens of diplomats and politicians have failed to do – force several of the multiple militia operating in Libya to form a loose alliance against him. But the general has some powerful backers – and he returned to Libya on Sunday having secured the “unequivocal support” of the Egyptian leader Abdel Fattah el-Sisi. “The president affirmed Egypt’s support in efforts to fight terrorism and extremist militias to achieve security and stability for Libyan citizens throughout the country,” Mr el-Sisi’s office said. 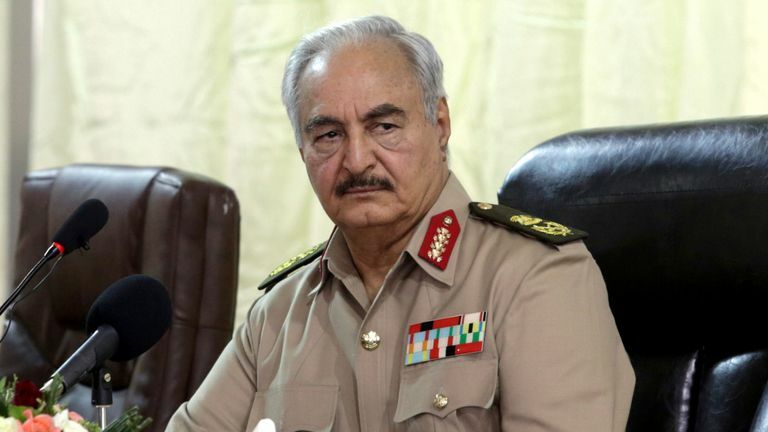 General Haftar has positioned himself as the guardian of the capital, saying he’s moving his self-styled Libyan National Army fighters into the city to clear it out of what he describes as terrorists. 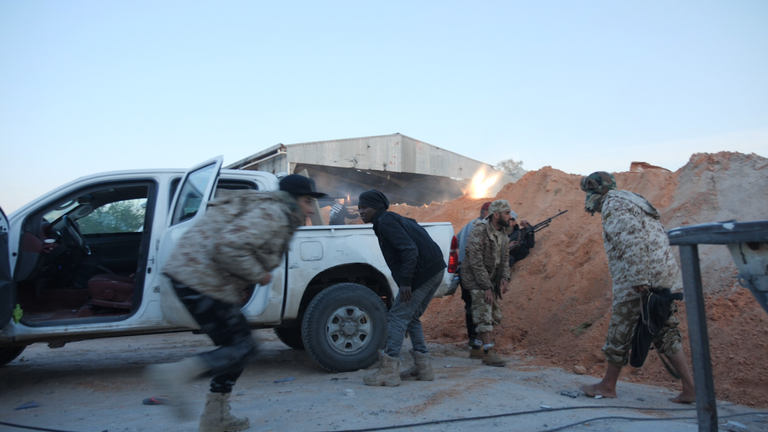 But the fighters ranged against Haftar’s men view it as a blatant attempt to militarily seize power. 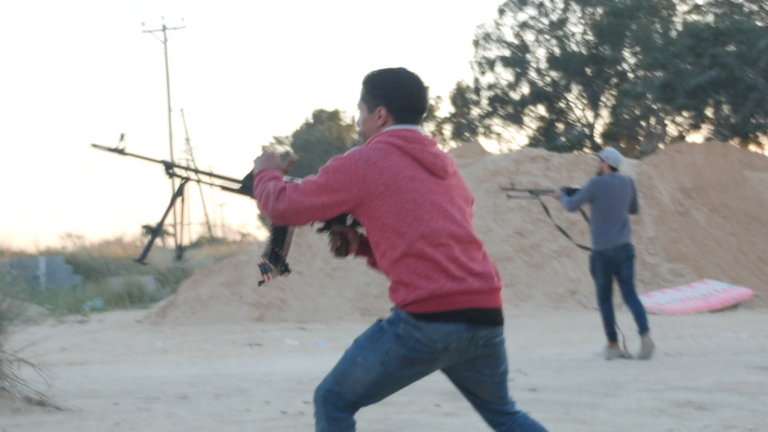 They’ve formed themselves into what they’re calling the Tripoli Defence Force. 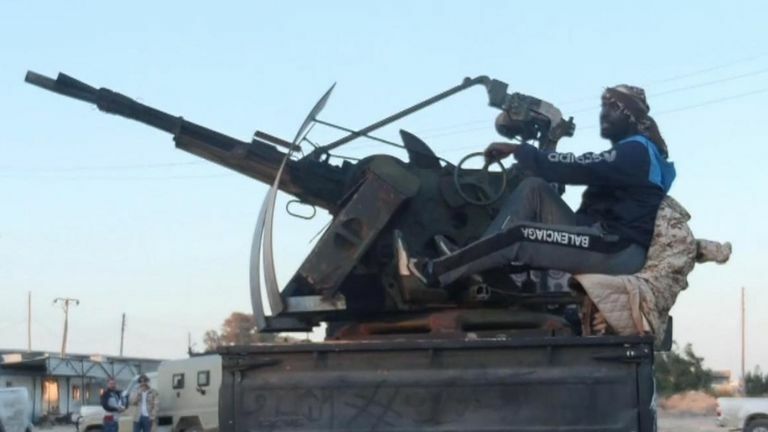 There appears to be much concern amongst the civilians living inside the capital’s perimeter, under the internationally recognised Government of National Accord (GNA) in Tripoli, led by Fayez al-Sarraj. Most are not at all sure which way this conflict is going to go – or who will be the victor. Consequently they’re nervously trying not to obviously take sides. Many of them are furious – and much of their ire is against the West. “They started this mess. Where are they now?” one elderly man screamed. He was referring to the revolution of 2011 when rebels rose up against the country’s former leader Colonel Muammar Gaddafi. They were helped by intelligence, logistical support and arms from NATO countries – specifically Britain and France. But there’s been heavy criticism about their lack of a post-conflict plan. It is a mess – and sadly for the people of Libya – it’s just got a whole lot messier.